DOVER—The 4th Annual Artisan Faire at the Woodman Museum will feature the work of about 40 fine artists and craftsmen from throughout New England. All of work is handcrafted with styles ranging from traditional to contemporary. The range of mediums is diverse and will include painting, printmaking, ceramics, woodworking, textiles, basketry, glass, and metalsmithing. The show will be installed in the Thom Hindle Gallery of the 1825 Keefe House on the campus of the Woodman Museum. The elegant setting provides a special shopping experience and highlights the beauty of the artwork. Elena M. Sarni of Pine Tree Pop-Up is curating the show for the second year. 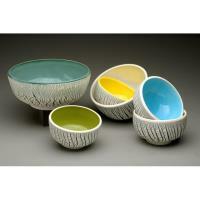 Her background as a curator and art journalist has enabled her to build an amazing roster of artists and craftspeople. There will be a mix of returning artists from last year, as well as the addition of several new artists. Some of the returning artists include crowd favorites such as painter Susan Hanna of SEH Studios; pastel artist Wolfgang Ertl; shaker style woodworker Mark Jacobs of Jacobs Woodworking; birch-inspired potter Hilary Rousselle; and printer of textiles and paper goods Eliza Jane Curtis of Morris and Essex. New artists include award-winning jeweler Kate Mess; the pottery duo of Turin & Turin Clayworks (work shown); reduction linocutter Sherrie York; and designer of hand-printed textiles Susana McDonnell of LinoCave. There is truly something for everyone and a range of price points. The show will be open Fridays, Saturdays, and Sundays from 10:30 a.m. to 4:30 p.m. beginning Nov. 23 (Plaid Friday) through Dec. 23. Join us at the Woodman to support the museum, regional artists, and to select unique holiday gifts. The Woodman, founded in 1916, is a traditional early 20th-century style natural science, history, and art museum with exhibits for all ages. The campus is home to four buildings, which include the Woodman House (1818), the Hale House (1813), the William Damm Garrison (1675) and the Keefe House (1825). The museum’s collection includes hundreds of colonial artifacts, a comprehensive mineral and fossil collection, mounted animal specimens, fine art and furniture, an extensive collection of militaria, local history objects, and much more. The Woodman is open seasonally to the public (from mid-March to mid-December) Wednesday through Sunday, 10am-5pm. The Thom Hindle Gallery at the Woodman (15 Summer St., Dover, NH 03820) features a series of rotating exhibitions and is free to the public during normal museum hours. For admission prices or to learn more about the museum or how you can help its mission, please visit www.woodmanmuseum.org.